Milwaukee Art Museum Through Flowered Trees galaxy s8 case by Devinder Sangha. Protect your Galaxy S8 with an impact-resistant, slim-profile, hard-shell case. The image is printed directly onto the case and wrapped around the edges for a beautiful presentation. Simply snap the case onto your Galaxy S8 for instant protection and direct access to all of the phone's features! 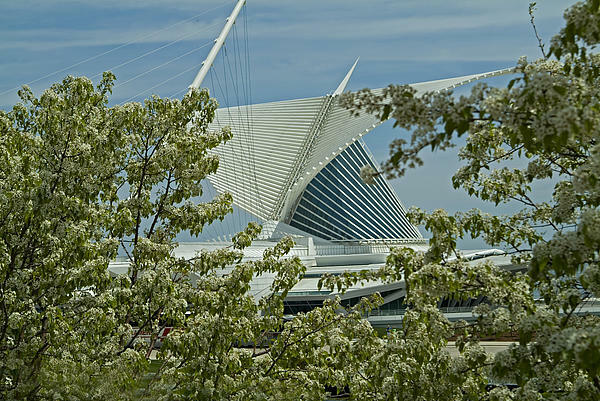 There are no comments for Milwaukee Art Museum Through Flowered Trees. Click here to post the first comment. 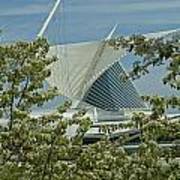 Milwaukee Art Museum recently gained international recognition with the construction of the white concrete Quadracci Pavilion, designed by Santiago Calatrava (his first completed project in the United States), which opened on May 4, 2001. 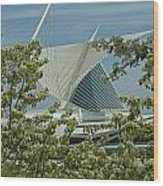 The pavilion was engineered by the Milwaukee-based engineering firm, Graef, while the construction manager was also Milwaukee-based, C.G. Schmidt. The structure contains a movable, wing-like brise soleil which opens up for a wingspan of 217 feet (66 m) during the day, folding over the tall, arched structure at night or during inclement weather. The brise soleil has since become a symbol for the city of Milwaukee. In addition to a gallery devoted to temporary exhibits, the pavilion houses the museum's store and its restaurant, Cafe Calatrava. The pavilion received the 2004 Outstanding Structure Award from the International Association for Bridge and Structural Engineering.